BUENOS AIRES, Dec. 1 (Xinhua) -- Leaders of the Group of 20 (G20) major economies wrapped up a two-day summit here on Saturday amid a strong call for work in tandem to "steer the world economy in the right direction." Addressing the 13th G20 summit in Buenos Aires, Chinese President Xi Jinping spelled out the risks facing the world economy, and the steps the developed and emerging economies can take to bolster global growth. Given the various challenges and profound changes in the world landscape, Xi called on G20 members to "have a stronger sense of urgency, be rational in approach and look beyond the horizon." Titled "Look Beyond the Horizon and Steer the World Economy in the Right Direction," Xi's brief but pertinent speech on Friday highlighted the danger of unilateralism and protectionism. He offered a four-point solution that begins by calling on G20 members to "stay committed to openness and cooperation, and uphold the multilateral trading system." His remarks were echoed by other G20 leaders, who also warned that the world economy is facing increasing risks as protectionism and unilateralism are on the rise. "This is a time when we as world leaders have an opportunity to come together to address challenges head on and work through our differences for the common good," said Argentine President Mauricio Macri, the host. "The spirit of the G20 is to promote a dialogue that is respectful of differences and to foster actions based on common interests," Macri added. Echoing Xi's proposal, Brazilian economist Julio Miragaya said that the importance of multilateralism is "phenomenal" because without it the law of the jungle prevails. Argentine political observer and columnist Jorge Castro said that by stressing the importance of the multilateral system, Xi "put the reality of today's trade into words." "Multilateralism reflects the reality of today's global system," he said. In addition to openness and multilateralism, Xi's four-pronged solution also includes partnership, innovation and inclusiveness. The Chinese president has a clear vision of how things are and need to be, said Castro. 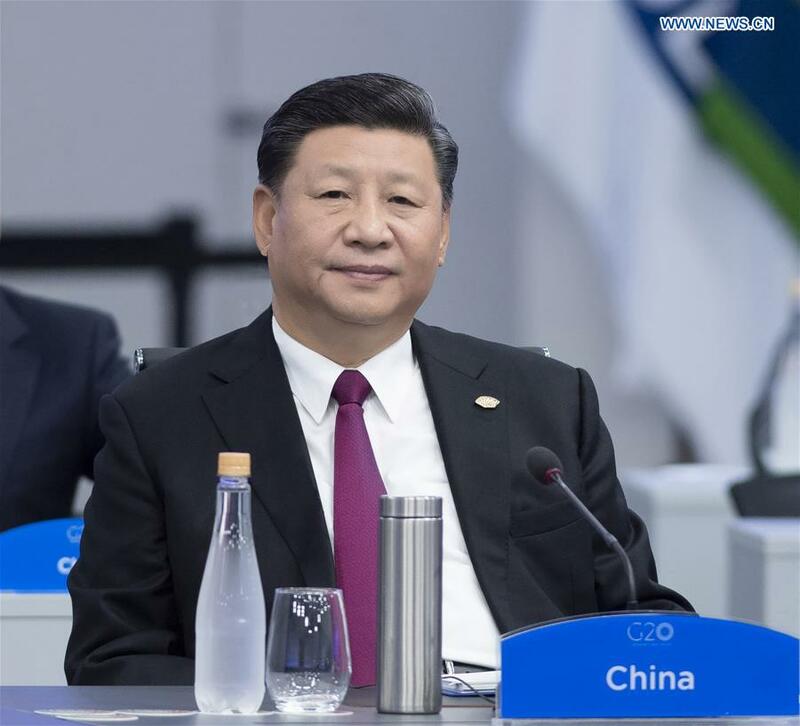 "President Xi told his G20 colleagues that the world has entered a process of transformation, an era of a new industrial revolution, which is a challenge and an opportunity for the countries of the world," he added. Argentine public policy expert Patricio Giusto also underscored Xi's ability to hone in on the issue. "The speech was a strong and clear message, spotlighting the importance of opening-up and cooperation within the framework of the G20, for the sake of safeguarding the multilateral trading system," said Giusto, also a professor with the Catholic University of Argentina. "The path China points to, of open cooperation to protect the multilateral system, is the path that the majority of G20 powers are betting on," he said. Embracing the concept of an open economy and free trade is what helped China speed up development, enabling it to lift millions out of poverty, Xi noted. "This year marks the 40th anniversary of China's reform and opening-up. During the past 40 years, with the support of the international community, we in China have forged ahead with perseverance and made historic achievements in development," said Xi. According to Gonzalo Tordini, an Argentine expert in international economic cooperation, "China's most significant contribution" since launching its reform and opening-up has been reducing poverty. Economic consultant Giusto described China's contribution to the global economy in recent decades as "enormous" as well as multifaceted. "With expanding trade, investment and loans made through its financial agencies, China today accounts for about a third of global growth. In Latin America, China has become a strategic partner, based on a natural economic complementarity," said Giusto. Castro, also head of the Institute of Strategic Planning in Argentina, believes China will continue to play a vital role in driving global growth as the engine of the world economy. "China is the fundamental factor of global economic growth, and that trend is increasingly stronger. It's not for nothing that China is the main trade partner of 145 countries around the globe. That trend is going to hold," Castro said.